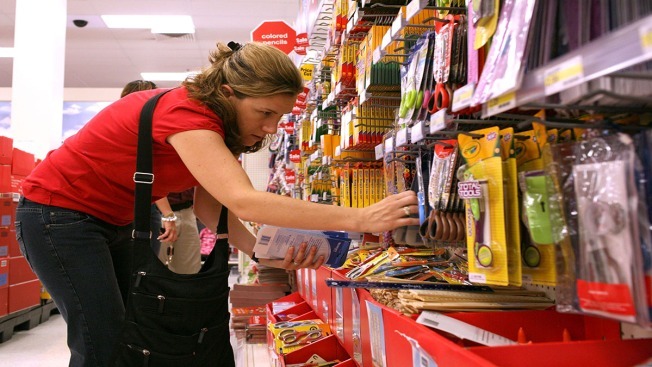 In this file photo, a school teacher shops for back to school supplies at a Target store in Daly City, California. The summer weather may still be in full force, but fall is definitely in the air, at least when you consider one of the year's biggest retail events: Back-to-school shopping. Here's a list from NBC News of expert tips on how to get the best savings — and navigate the chaos with as little stress as possible. Before heading out, be sure to make a budget and compare prices at a few different locations. Take inventory of items you already have, and clip some coupons from your local paper. When you hit the store, leave the little kids at home to prevent overspending. Shop around, and don't miss the clearance or sale aisles. To save on specific items, August is a good month to buy sneakers and office supplies. Though backpacks, lunch boxes and clothes may be in smaller supply after the school year starts, wait to buy them in later months when they go on sale. Also, consider buying tech refurbished and on tax-free holidays or major shopping days like Black Friday or Cyber Monday.